Johnson Lake BC, just over an hour away from Best Sun Peaks, is an isolated, wilderness lake that wins our award as one of the most scenic, colorful and clearest lakes we have ever seen here in British Columbia. It is a rustic and pristine wilderness area and must be treated with respect. There are very few areas to camp, no access for large RV's or fast motor boats, and all visitors must leave only footprints and take only photos and memories. With runoff from the nearby melting snow on the mountains, and the underground, spring-fed water being filtered by limestone, it is easy to see why Johnson Lake is referred to as the “Caribbean of the North”. With some areas of Big Johnson Lake (there is an adjoining Little Johnson Lake too) having limestone sand, you would swear you were in the Caribbean with the crystal clear water and various shades of blue, turquoise and greens in the deeper areas. PLEASE NOTE JOHNSON LAKE HAS VERY LIMITED SPACE AND AMENITIES, AND THE CAMPGROUND IS CONSTANTLY FULL. 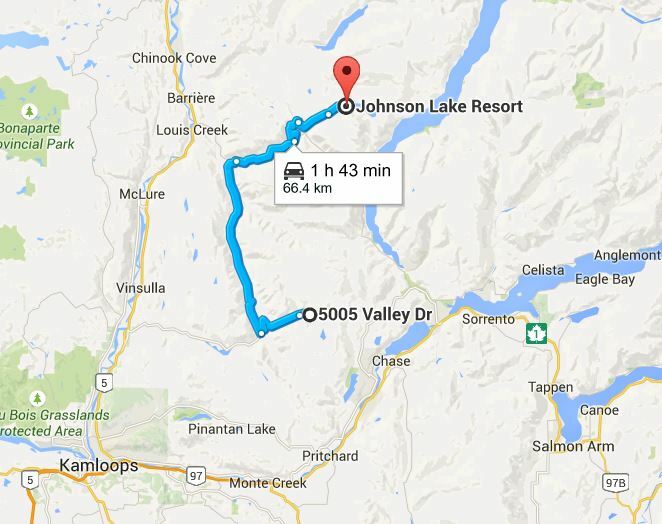 PLAN A DAY TRIP FROM SUN PEAKS RESORT FOR OPTIMAL ENJOYMENT. SUN PEAKS SKI RESORT IS ABOUT 70-90 MINUTES AWAY AND HAS MANY SUMMER ACTIVITIES, ACCOMMODATION OPTIONS, RESTAURANTS, PUBS, CONCERTS AND EVENTS TO ENJOY. DISCOUNTED SUN PEAKS LIFT PASSES FOR SUMMER HIKING AN BIKING ARE ALSO AVAILABLE. 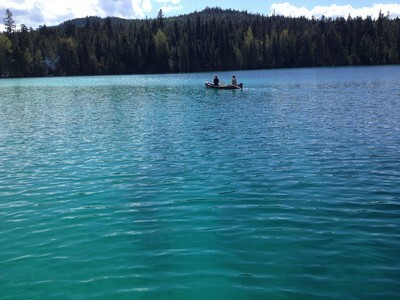 Big Johnson Lake BC is around 5 kilometers (3 miles) in length and around 200 feet (60 meters) at the maximum depth, with the visibility being around 50-60 feet in places. At one end of Big Johnson Lake BC, there is a short, gravel lined channel connecting it to Little Johnson Lake which is perfect for spawning Kamloops Rainbow Trout. Soon after the ice melts in the spring, hundreds or perhaps thousands of 2-3 pound (or even perhaps 5+ pounders) Kamloops Rainbow Trout spawn in this channel. Go past at the right time and the stream will be alive with trout. And after a summer spent feeding and growing in the channel, the fry head back to the depths of Big Johnson Lake via specially built fish ladders. 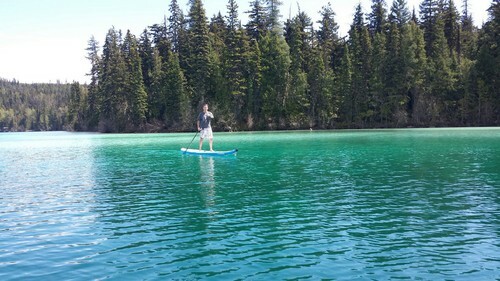 •	Our favorite – stand up paddleboard (SUP) – rentals can be arranged at Sun Peaks before your trip. Please note - there is nothing fancy there - it is a beautiful, isolated, wilderness lake worth seeing and enjoying but it is not set up to be a big campground type location. Note: Remember your fluids, sunscreen and some bug spray…..
Getting to Johnson Lake is pretty easy and only about 70-90 minutes away from Sun Peaks, Kamloops or the Shuswap. The routes are a combination of paved, graded, and not-so-graded gravel roads. 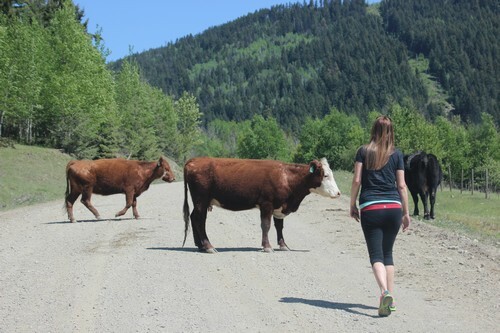 Watch out for cows (yes, cows) and logging trucks on various parts of the journey. Be respectful of slow-moving farm vehicles. 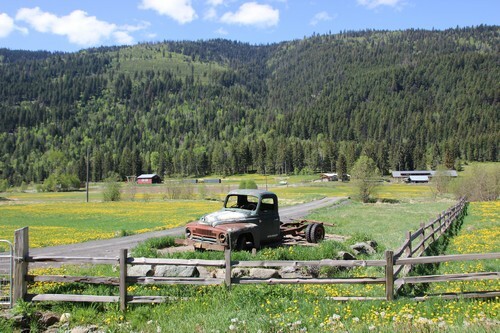 They involve a fairly gradual climb to an elevation of 3,800 feet (1160 meters) so most cars and car-towing trailers can get there safely in the summer. it is just the last leg that is quite dusty and subject to large potholes. There also isn't much room to turn around for large rigs. •	Turn left and follow along this forestry road around 16 km to the entrance to Johnson Lake Resort, and then a further 6 km past several small pull-out day camp areas, to the Ministry of Forests campground at the other end of Big Johnson Lake BC. Here there is room to park your vehicle, or drive into the small Ministry of Forests campsite and set up your tent or small trailer on a first-come, first-served basis. (it has an outhouse but that's it!). It is a very small area and very rustic. The campground is also very small and the sites are also small and close together. If you want a little more privacy, consider camping at or near Sun Peaks Resort. Or better yet, stay at Sun Peaks and enjoy the whole resort area. The area is busy with dirtbikes and quads in the summer so be careful. There is a small roadway into the lake for carrying your floats or car-top boats into the lake. Large blocks are in place to prevent larger boats from entering the lake. Johnson Lake BC is a beautiful lake and a wonderful day trip on a sunny day - we hope you safely enjoy your day trip from Sun Peaks.